Today after having a really great lunch with my daughter, Leilani, I was driving to the gym on a residential road. The speed limit there is 25 mph with one of those flashing speed signs showing if youʻre going over the speed limit. There are also signs that say the speed limit is 20 mph if children are present. There were no kids, and the sign didn’t flash at me because I was going 25 mph. However, the stupidhead man with an obvious anger problem behind me was tailgating me in his big, red, SUV, so close he was almost on my bumper. He was definitely harassing me. I looked in my rear view mirror at one point, and he was giving me the one-finger salute, over and over again. Actually, it kinda looked like some sort of a pop-up toy or something. He had a really pissed off look on his face. Years ago I would have been so intimidated that I would have sped up because there was so place to pull over. But nope, not anymore. I’ve been working really hard on developing the ability to stand up to bullies. And that’s what I did. I just kept driving at 25 mph and the stupidhead bully turned off onto another residential street and roared off. Good riddance. But seeing his anger and his rude gesture left a really sour taste in my mouth, particularly since I’d just had such a lovely lunch with Leilani. So I decided that my photo of the day would be something particularly beautiful. And this is it. 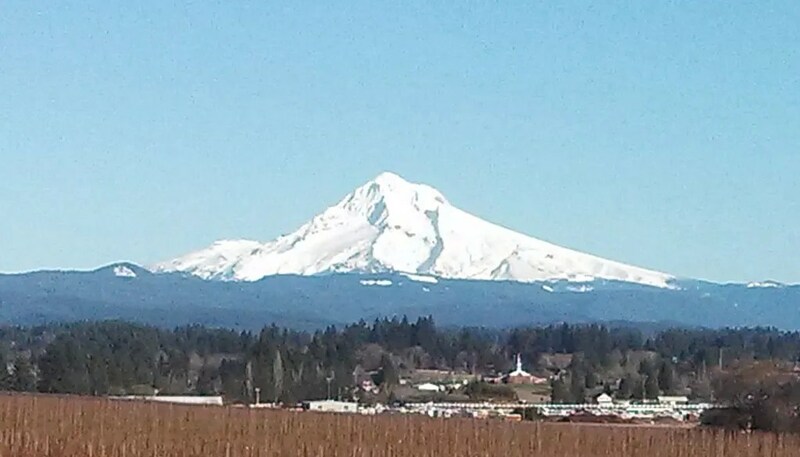 Glorious Mt Hood on a sunny Oregon day. I run into idiots like that everyday going to and from work. I do 72 miles one way all week back and forth. What I normally do is slow down and barely touch the brakes till they fall back and then I speed up. I’ll do it again till they get the message. Damm stupid heads. Good for you for not letting that lolo intimidate you. Think of how unhappy he must be that your going the speed limit was so annoying to him.